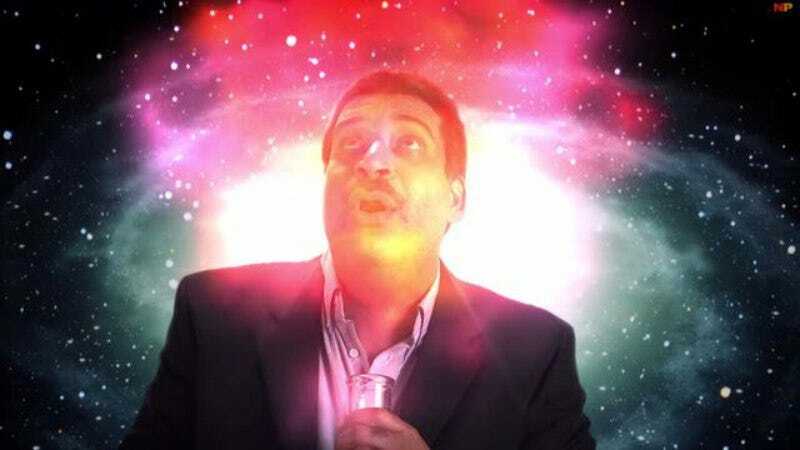 Providing arguably the most opportune instance for a cable television outlet to discuss gravity bongs since the infamous “Isaac Newton Drug Bust” episode of Cops, Neil deGrasse Tyson’s new talk show will premiere on April 20. Variety reports that the National Geographic channel will launch StarTalk, Tyson’s new late night talk series, on the calendar date that has commonly come to be known as the day that your friend who regularly makes pipes out of apples won’t shut up about. When we first reported on Tyson’s new show, the astrophysicist had stressed that his new show would not court controversy, as evidenced by picking as one of his first guests Richard Dawkins, the famously affable, Norman Rockwell-esque father figure everyone in America finds unchallenging. Tyson’s show is adapted from his podcast of the same name, and features a one-on-one interview with a main guest, followed by a panel discussion of that week’s topic conducted in front of a live audience in New York City. Each episode will also feature a taped segment from Bill Nye, presumably recorded ahead of time because the beloved science educator is way too high to communicate rationally in real time. The series will air Mondays at 11 p.m. ET, with repeats on Friday evening at the earlier hour of 7 p.m., just in case the audience got the munchies the first time around and left home to hit up some Taco Bell. Left unaddressed by Nat Geo is whether they gave Tyson the show simply because the combination of Tyson and being super high is what the Internet decided it wanted long ago.